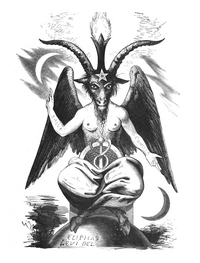 The 19th century image of Baphomet, created by Eliphas Lévi. The arms bear the Latin words SOLVE (dissolve) and COAGULA (congeal). Baphomet is a name of unestablished origin. It first appeared in trial transcripts during the inquisition of the Knights Templar in the early 1300s. Some modern scholars believe the name to have been an Old French corruption and misspelling of the name Mahomet (Muhammad). Nowadays it is generally viewed as a symbol of the Devil. In the Middle Ages, the Templar were accused of heresy, such as denying Jesus Christ and spitting on the cross. They also supposedly worshiped an icon called "Bafomet". Beyond this, little is known about the origins of the Baphomet. In the 1800s, magician Eliphas Levi interpreted Baphomet as an occult symbol representing perfection, or the union of opposites to create divine harmony. To illustrate his point, he depicted the entity as a goat-headed androgyne with wings, female breasts, a rod between its legs, and a flaming torch between its horns. This imagery was soon used by people who thought it was Satanic- notably in anti-Freemasonry tracts, where some writers accused Masons of worshipping the devil. Many evangelical Christians still believe masonry to be of the devil. In modern times, Baphomet has been adapted as a symbol by occultists and Satanists. A related symbol (also drawn by Levi) is the Sigil of Baphomet, which is a goat's head drawn inside a five-pointed star. It has become a common icon among heavy metal bands like Slayer and Venom. The Sigil of Baphomet is also the official logo of the Church of Satan. Wikimedia Commons has media related to Baphomet. This page was last changed on 13 June 2018, at 09:39.